Even though people often strive to suppress it, “the past,” as William Faulkner once wrote, “is not dead, it is not even past.” Surely, many of us frequently attempt to stifle, elide or erase certain elements in our past, yet ultimately the thorny business called history comes back to haunt us, demanding that we confront it. 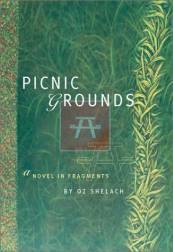 Picnic Grounds, Oz Shelach’s first book of short stories, is, in many respects, an attempt to address some of the hidden aspects of Israel’s past, disclosing certain facets of the Israeli landscape and culture which for years have been buried in some dark corner. It is an archaeological excavation, of sorts, an excavation into the heart and soul of Israeli society. Shelach digs in cautiously and skillfully, using irony, wit, and humor to lure his readers into the mysterious and, at times, sinister attributes that have, for the most part, been concealed from the public’s eye. In the book’s first story, “One Afternoon,” a history professor takes his family on a picnic in a pine forest near Givat Shaul, a Jerusalem neighborhood. The professor teaches his son some of the camping skills he learned while serving in the Israeli military, using old stones to block the wind and to protect the newly-lit fire. The stones, we are told, are the remains of homes of a village known as Deir Yassin. Although Shelach does not say as much, Deir Yassin was a Palestinian village located on the outskirts of Jerusalem. The Jewish neighborhood which now stands in its place was built not long after Israeli paramilitary forces evicted its Palestinian residents by carrying out a massacre, killing an estimated one hundred men, women and children out of a total population of 750. There is something striking about the book’s pithy style. Using a small number of words, Shelach manages to describe events which reveal hidden truths about Israeli society, truths which are seldom discussed. A story called “Complaint” is one example. The proprietor of a bar in the Russian Compound received complaints from patrons about sounds that filtered into his bar at night and tainted the drinking pleasure. He sent numerous letters to the police, pointing out that these unsettling voices, as he called them, came from the jail across the street, traveling from the interrogation rooms deep under the police station -- four, some said six floors underground -- all the way up to his bar on the street level. He even visited the police headquarters in person to make his case heard, but the voices persisted. Finally, the bar owner had no choice but to increase the volume of the music playing in his bar during quieter hours. His hearing deteriorated. Many a young Jerusalemite has visited the bars located outside the Russian Compound, where the Israeli secret services continue to interrogate Palestinian detainees. Shelach captures the surreal reality of cocktails, music and torture. The somewhat quirky ending -- “His hearing deteriorated” -- only serves to highlight that the atrophy of human senses has become the condition of possibility for many Israelis, who could not otherwise cope with the fierce reality of the Middle East. “Complaint” also draws attention to the idiosyncratic way Shelach uses the English language. It is almost as if he is speaking Hebrew, but in English. Indeed, the author is very conscious of the words he employs, attempting to give the English reader a taste of the Hebrew, while simultaneously exposing some of the peculiar characteristics of Hebrew terms. In this sense, and not only due to the distinctive plots, Shelach’s collection of short stories is much more Israeli than most Hebrew books which are translated into English. There is something about the sound, tempo, and rhythm of these stories that gives them a uniquely Israeli flavor. Language, as bell hooks once said, is a place of struggle. Shelach, so it seems, has adopted this view and is interested in using English -- the language in which he still feels uncomfortable -- to expose Hebrew, the language in which he is at home. “Home” and the “well-known,” he appears to sense, can also come to mean mediocrity, the existential condition of becoming comfortably numb. In one story he translates Misrad HaMishpatim as the Ministry of Trial, exposing, as it were, to the English reader the literal meaning of the ministry’s name (in English newspapers it is translated as the Israeli Ministry of Justice). Simultaneously, this literal translation in and of itself suggests to the reader that this ministry deals more with trials than with justice. I met Shelach in 1990 in the dark labyrinths of the Mount Scopus campus of Hebrew University in Jerusalem. We were both undergraduates, both active in the liberal left party Ratz. The first Intifada (Palestinian uprising) was underway, and yet most students and faculty at the university continued their daily routine as if life outside the university walls was in some sense normal; they were living, in Shelach’s words, outside history. In the story called “A Reflection” this so called unbearable lightness of being forcefully comes across. “Prepositions differ from one language to another in apparent arbitrariness, but they illustrate the presuppositions of a language…” Each Tuesday afternoon throughout the fall semester the student was lulled to sleep by her professor’s lectures on epistemology. Five of the walls that formed the octagonal classroom were too small that the classroom looked more triangular than octagonal. The door was painted orange in agreement with all the doors of the same octagonal foyer, distinguishing it from the next octagonal foyer, which was governed by lilac, from the next, governed by pale green, and so on until foyer number eight, designed, the student thought, like the entire Hebrew University to block any view of the outside, to narrow the mind, to keep everyone focused on their own reflections and ignorant of anything important. When she woke up and saw, in the single window, a shining object sticking up into the sky, no other student, nor their professor, was looking out the window. She could not tell it was the setting sun reflected by a minaret-top golden crescent, on the next mountain peak to the east. The sound of shots drifted into the classroom window. Beyond the narrow view, in the fold of the valley, our soldiers were mowing down protesters. Then the shining crescent disappeared into the long shadow cast by the university tower. “There's something so captivating about these ‘fragments,’ about their beguiling simplicity, about the things they so eloquently withhold, something so pure and unpretentiously fresh,” Anton Shamas writes on Picnic Grounds cover. And indeed, Shelach has produced an enticing little book, that is both luring and unsettling, but most of all helps one understand some of the major undercurrents informing modern day Israeli society and culture. It is a fascinating read. Oz Shelach will be touring the United States in the next three months and recently told me that he is still looking for reading engagements. He can be reached at book@oznik.com.